Update: What a silly post this turned out to be. You gotta love college football. Florida has a chance to win the Southeastern Conference Championship tonight. Been there, done that. Five times. The Gators know the only real championship game in college football will be played Jan. 8, and no matter what happens in the Georgia Dome this evening, their season won’t make it that far into the new year. Despite having the same amount of losses as Southern Cal and Michigan, it seems like most people are completely content with the idea of the Trojans playing themselves into the BCS Championship game opposite Ohio State or the Wolverines getting their rematch on neutral grounds. 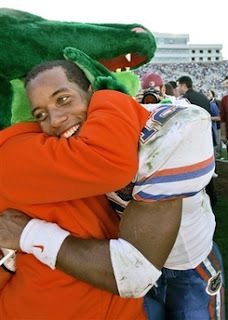 No one has love for the Gators. Sure it’s disenchanting to hear Urban Meyer lobby for his team like he’s still coaching a school no one watches. And no, they probably can’t beat the Buckeyes. But disliking a coach’s actions or just assuming a team is a bad fit for the title game should never play into one’s vote when it comes to the national rankings. That’s what has happened in Florida’s case. It used to be that losing early hurts a team less than, oh say, losing its final game of the regular season. Not this year. The Gators lost to Auburn two weeks before USC lost to unranked Oregon State and five weeks before Michigan dropped its last game. Somehow, they were still jumped by the Trojans while the Wolverines stayed ahead of them the whole time. All because the voters have inexplicably decided they can’t do as well against the Buckeyes as their counterparts. A lot of the media points at many of Florida’s games being close as a way of deeming them unworthy. Apparently winning by a few points isn’t as valuable as losing by a few. It’s hard to understand what exactly they’ve done wrong. It’s certainly not about who they lost to. Auburn is far better than Oregon State. Then again, it’s not about who they beat either. LSU and Tennessee are probably better than Notre Dame and Wisconsin. Assuming things play out as expected and both Florida and USC win today, people might start calling the Gators’ season a blessing in disguise. After all, this year more than any other suggests a four team playoff would work better than a “plus one” game or an eight team tournament. They won’t get their crack at Ohio State, but they’ll have their SEC title, win the Sugar Bowl and maybe one day be remembered as the team that helped destroy the evil BCS. You can bet on what Meyer and his team will be thinking. Posted by Dan McGowan at 12/02/2006 hype it up! Nice post. Thanks for the plug. I'm adding you to our blogroll.